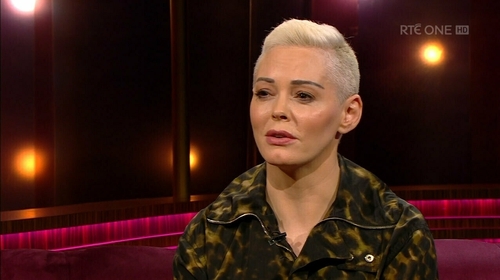 Actor and activist Rose McGowan spoke about the "cult" of Hollywood on Saturday night's Ray D'Arcy Show. McGowan grew up in Italy in a cult ran by her father called the Children of God. She now describes her experience working in Hollywood as being similar to being in a cult as it's "the same kind of coercive power structure". Speaking to D'Arcy, she explained: "It operates in secrecy. Most people think that what happens in Hollywood, it's just 'that's Hollywood!' it's over there, but it goes out to the world. "And it's twists your head and you have to really careful when you're there. I think people need to be careful even when they're casually watching movies or TV, start looking at the information that they're giving you, not just in the lines." She added: "Like I was sent a script and for no reason the woman was carrying a laundry basket in every scene, she never did the laundry, there was no washing machine anywhere around her, but she always had a laundry basket. Why?" In her new memoir Brave she writes about how a lot of women's stories in Hollywood are told by men. She said of this imbalance: "There's nothing wrong with men directing movies they just should be a balanced thing. "In the Director's Guild of America it's around 96% men and that statistic hasn't changed since 1946, so people that think Hollywood is a progressive place I would just beg to differ." D'Arcy also asked McGowan about disgraced Hollywood producer Harvey Weinstein, who she calls "the monster" in her book. The actress alleges he sexually assaulted her in a hotel room in 1997 during the Sundance Film Festival. She first revealed the allegations in a New York Times article published in October 2017. Speaking on the show, McGowan said: "I thought my life was getting easier and after the meeting it turned out my life was not getting easier, it got very hard. It took a different turn and one I had not anticipated in any stretch of my imagination. "Because I was a homeless kid when I was 13, I was a runaway, I've had quite a life and I turned to someone before going into to the meeting, it was a breakfast meeting, and said 'I think my life is finally getting easier'. "And I blamed myself for a long time that I jinxed myself by saying those words, but the reality of that situation or any situation when you're sexually assaulted is that it's not your shame and you can give it back." When D'Arcy asked her if she suffered from post traumatic stress, she said: "Still. I still have nightmares." She said her career trajectory changed and she was forced to move from film to television work. "I was on a very different trajectory. The only job available to me was on TV. And it was kind of right before the Golden Age of TV, before it was cool to do TV", she said. "People that had followed my film career couldn't understand why I was on this TV show all of a sudden. It was seen as step down or a step sideways or a weird step." "I know I was blacklisted, heavily", she said. "It's theft really. Short of murder it's the highest form of theft." In her book she described being in "a million pieces" after the alleged incident. D'Arcy asked her: "How are you now, Rose McGowan?" "I'm in one piece," she said simply to applause from the audience.